If your boiler is sounding like a large kettle well its because it is!! 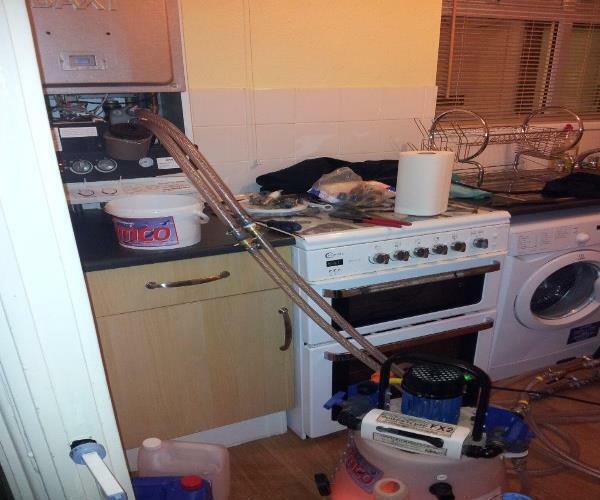 Your boiler is suffering with lime scale and rust from your radiators, that is in your system ( heat exchanger ). In your radiators you may find you have to keep venting (bleeding) them, this is not always air it could be a harmless gas from the radiators corroding. This is costing you a lot of money in fuel bills each year and will cost you a lot of money on fixing your boiler. What we can do is power flush your system and remove all your rust and lime scale, just like this customer is having done (above). The average cost of power flushing 5 to 7 radiator system is between £550 to £670*, the more radiators you have the more it will cost due to more cleaning chemicals needed. If you have a new condensing boiler they have alloy heat exchangers, and the strong acid can NOT be used to clean them, so a weaker acid has to be used and a lot more of it, so if you have had a new boiler fitted and did not power flush the system it will cost you more than the above price**. For every extra radiator panel on your system will be an extra £15 / £20 each. If you have alot of radiator panels then we can sort out a fixed price. ** Price for alloy Heat Exchangers will be about £600 to £750 for 5 to 7 radiator system. After having a power flush on your heating system, at Abbotts Maintenance we highly recommend having a Magna Clean Filter installed onto your system. The Magna Clean filter is designed to remove all iron oxide particles that contaminate your system. The filter is a magnet that collects all the iron particles that are present when your heating system is in use. A Magna Clean Filter is highly efficient and can remove virtually 100% of the iron oxide (rust) which builds up in your system naturally overtime due to the constant flow of water through the central heating system. Once you have a Magna Clean filter installed it is important that it is cleaned out at least once a year to ensure the filter works at its best. This can be done by you and does not require a central heating engineer. If left un-cleaned the magnetic part of the filter will be unable to collect the iron oxide thus causing more central heating problems and can result in you having to have another power flush completed. There are no on-going running costs with a Magna Clean filter. 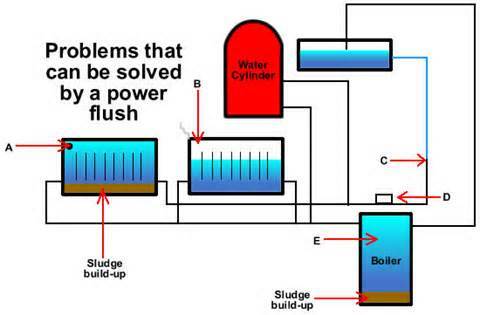 A Magna Clean Filter can collect, on average, a year’s worth of sludge build up when attached to a new or recently power flushed system, and will then need cleaning. If attached to a system which has a large build up of sludge inside, the Magna Clean filter will need to be cleaned more regularly for the first year, then once a year thereafter.